Should I use tablets or solution? How often should you use disclosing products? You have probably have heard of something called dental plaque. Plaque is a sticky substance on the teeth that contains bacteria. Plaque is a biofilm – a community of microorganisms. Plaque itself is made up of tiny food particles, bacteria, and the waste products of bacteria. It builds up over the course of the day, and this is completely normal. Whilst some bacteria in plaque are harmless, but some are harmful to your oral health, including gum disease and tooth decay. The food you eat, warm temperatures in your mouth, saliva and ph levels create an ideal environment for plaque to grow. This gingivitis, if left untreated, can also develop into periodontitis. Failing to remove plaque will also result in the plaque hardening into something referred to as tartar or calculus. Calculus is more sticky than your teeth and more plaque will stick to this tartar/calculus than your teeth. This will lead to even more bleeding. At this stage, it can only be removed by professional cleaning. Everyone is susceptible to plaque and tartar build up, but it is something we can prevent with cleaning at home. The bacteria in plaque also cause tooth decay – holes in your teeth that require fillings. That is because the bacteria produce acids which damage the outside surface of the tooth. Early stages of tooth decay are reversible, but long term damage is caused when the plaque is not removed and if you have a lot of sugar in your diet. To prevent plaque causing gum disease and decay, the solution is brushing your teeth regularly and properly. By doing so, this stops the growth of plaque and removes the food particles that feed the bacteria. Unfortunately too many of us do not brush correctly. Most of us have never actually been shown the correct way to brush and far fewer actually clean between their teeth with floss or interdental brushes. This inevitably means we do not remove all the plaque and bacteria within our mouth. Over time this builds up and problems start occuring. Sadly, too many of us don’t realise this until we start having issues or our dentist makes us aware of the problem. The first step is to educate yourself on how to brush and how to floss. Even when you have learnt this, how do you really know you are doing it right? Are you removing the plaque properly? Thankfully there are some ingeniously simple and cheap solutions to let you and I know whether or not we are brushing and flossing correctly. You can potentially see or feel plaque in your mouth. It is often a thick, sticky and sometimes fur-like deposit on the teeth and gums. It may make your teeth feel rough or even look slimy. It may look like a yellow, tan or brown stain. But, a much better and more effective method is using plaque disclosing agent, more commonly known as plaque disclosing tablets or solution. Disclosing swabs and floss are available too. When used, the dye sticks to the plaque to highlight to you areas where you could brush more effectively. Certain disclosing products will even dye parts of the mouth different colours to show the difference between new and old plaque. Plaque can be difficult to see, especially when it is between the teeth, on the inside of the teeth, or at the back of the mouth. In the early stages of its development it is colourless. If you are used to the feel of plaque, you may not even be aware of where it is building up in your mouth! Disclosing products are useful for showing where plaque has accumulated. Having been shown where it is, you can turn your attention to brushing and cleaning the affected area thoroughly. I don’t need to use plaque disclosing tablets, they are for kids. Plaque disclosing tablets highlight areas of retained plaque by staining them in a bright colour. This is useful for both adults and children. A study published in the Journal of Oral Research and Review found that half of those who used disclosing products had improved their oral care routine at home and reduced the plaque buildup considerably. Another study published in the American Journal of Orthodontics and Dentofacial Orthopedics examined the effect of showing showing images of plaque damage or using disclosing tablets on a group of 148, 11- to 25-year-olds who wore traditional braces. Split into 4 groups, one group were shown the damage caused by plaque buildup. Another group were given tablets, and the last group were given tablets and shown images of plaque damage. At the end of the study, the participants in the group that received tablets and were shown images of plaque damage had the lowest amount of plaque buildup. There are 2 types of plaque, old and new. New plaque is classed as being less than 12 hours old. This plaque will normally build up over the course of the day, between brushing your teeth. Old plaque is the buildup of bacteria that is older than 12 hours. This plaque really should have been removed the last time you brushed your teeth. 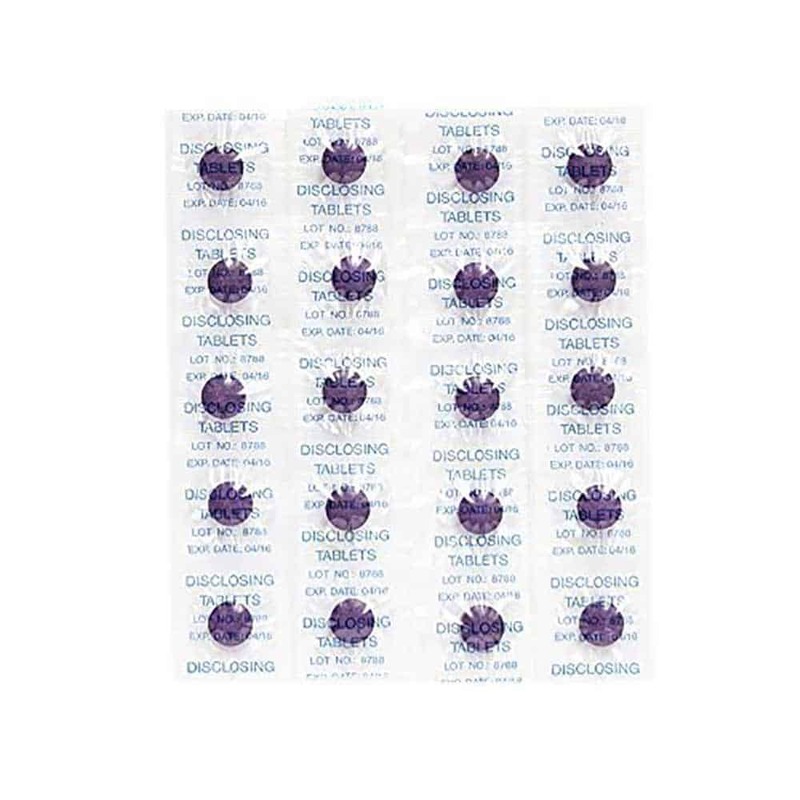 Most disclosing tablets highlight the two by showing as different colours when disclosed. It is not uncommon to see both new and old plaque when disclosing, but ideally, for the best oral health you want to rid your mouth of both. Old plaque is normally a Blue/Purple colour, with new plaque showing up as a Pink/Red tone. You should be concerned if you are seeing signs of a lot of old plaque. This is a sign that your brushing and flossing routine is not getting to all the areas in your mouth. Why are plaque disclosing tablets so useful? Plaque disclosing tablets highlight areas of retained plaque by staining them in a bright colour. This can be very useful to show you areas you are missing when brushing your teeth. Depending on whether you are using plaque disclosing tablets, solution, swabs or floss, the process is slightly different for each. Below I explain the process for tablets and solution, the most popular options. In any case, you may want to put some vaseline or lip balm on first to stop you staining your lips. Step 1: Brush and floss your teeth like you normally would first. Step 2: Take one plaque disclosing tablet, place it in the mouth and chew it thoroughly. Younger children may require only half a tablet. Do not swallow it. Mix with saliva and spread it around the mouth and all over the teeth and gums with your tongue. Step 3: Spit out saliva carefully (it can be messy) and then rinse your mouth out with water. Depending on how much excess dye remains you may need to rinse again. Step 4: Pay attention to areas of the mouth where brushing and flossing could be improved. Plaque will be shown or highlighted by dark patches to which the dye in tablet has stuck. In many instances old plaque (older than 12 hours will stain Blue) with new plaque (less than 12 hours old) staining Red/Pink. Step 5: Brush and floss your teeth thoroughly to remove the stains and plaque buildup. Step 2: Dispense a few drops into a dish. Step 3: Paint a small amount onto the teeth with a cotton wool bud or small brush. Step 4: Rinse your mouth out with water to remove the excess. Step 5: Pay attention to areas of the mouth where brushing and flossing could be improved. Plaque will be shown or highlighted by dark patches to which the dye in tablet has stuck. In many instances old plaque (older than 12 hours will stain Blue) with new plaque (less than 12 hours old) staining Red/Pink. Most people prefer the tablets. They tend to be easier for you use and manage. You do not need to paint the solution onto the teeth and gums. They tend to have a longer shelf life too. The choice is yours. You can use as frequently or infrequently as you like. You might want to use every few days until you perfect your routine and then check every few weeks to ensure you are continuing to reach all the plaque in your mouth. My recommendation is TePe’s Plaq-Search disclosing tablets or solution. TePe Plaq-Search tablets come in a pack of 20. You can buy them from most good pharmacy outlets or from online stores such as Amazon. Other brands exist as do various pack sizes. The solution tends to less common and most easily purchased from Amazon. Plaque build up over the course of the day is inevitable. Although plaque is something that affects everyone, each of us are different in our resistance and susceptibility to it. For some plaque may grow very quickly, others slower. The speed at which plaque grows tends to increase as we get older. Irrespective of your age or susceptibility there are some simple things you can do to reduce the plaque build up. Brush your teeth twice a day, morning and night, for 2 minutes to clean the tooth surfaces and along the gumline. Electric toothbrushes can be up to 10x more efficient than a manual toothbrush at removing this plaque, so investing in one could be worthwhile. The toothbrush bristles do not get in between your teeth as effectively as floss or interdental brushes. You should use either, or both, at least once a day to remove the plaque and food particles that build up on the surfaces we don’t see. As outlined in this article, these products can be really helpful to you in improving your routine and oral health. Going regularly for a checkup with a dentist ensures your get a professional opinion on your oral health. They will pick up any issues or concerns they may have and teach you how to address them. Plaque is here to stay. There is nothing we can do to stop it forming, growing and affecting our oral health But, we can control it and stop it from becoming a problem. A good dental hygiene routine is key, but disclosing plaque on your teeth is an ideal way to see if you are brushing effectively, without having to consult your dentist. Children and adults alike can get great benefit from this process and really learn how best to clean their teeth and interdental spaces. Regularly or irregularly, using a disclosing agent can help you tackle brushing problems or inconsistencies before they come a real issue, ensuring you have a cleaner and healthier mouth, suffer less and incur fewer dental bills. Below are a list of resources that might be helpful to you in the fight against plaque. How to brush your teeth properly – This guide shows you how to brush correctly with a manual or electric toothbrush. 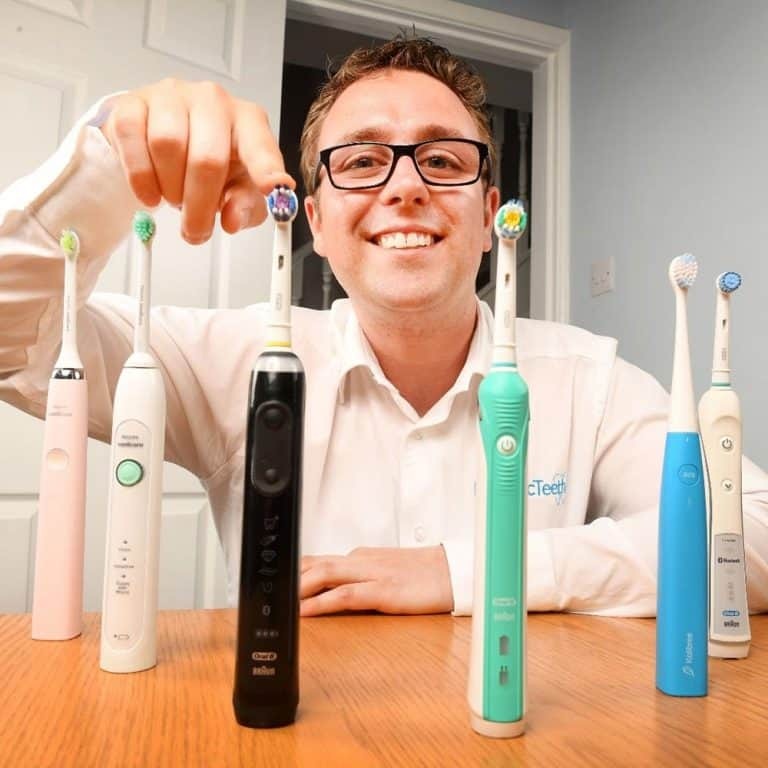 Electric Toothbrush Buyer’s Guide – This article lists the best electric toothbrushes on the market today. An electric toothbrush delivers many benefits in the fight against plaque build up. Best flossing tools – Learn about all the different products for interdental cleaning and find the ones suitable for you. I have answered a few of the key questions that arise with plaque disclosing through this article, but below are a few more frequently asked questions and the answer to them. Yes. Disclosing products are formulated with children in mind. They are a fantastic tool in educating children and encouraging them to brush better. Often they respond well to the very obvious before and after approach that disclosing involves as they can clearly see the benefits. It is recommended though that children under 12 are supervised when using disclosing agents. Is the disclosing agent harmful if I swallow it? Ideally adults and children alike should spit out or rinse off excess disclosing agent, but if swallowed you will come to no harm. Whilst different brands of disclosing agents differ in their makeup, most are made from simply food dyes that if ingested will pass through the body. Please consult the ingredients of the disclosing product before using if you have an allergy. What are plaque disclosing tablets made of? The ingredients differ from one brand to another. Often they are made from harmless vegetable dye that stains the plaque already resting on your teeth. Listed below are the ingredients from 2 TePe products, which I consider to be one of the leading choices within this market. Aqua, CI 42090, CI 45410, Methylparaben, Propylparben. TePe products are gluten free and suitable for vegetarians. Of course these ingredients are subject to change. Always check before use. if you are aware of any allergies to certain ingredients do not use. How do I remove the disclosing solution from my teeth? 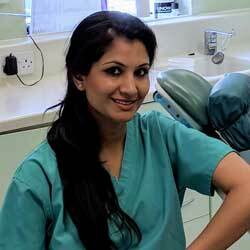 Brushing and flossing is how the disclosing agent should be removed from the teeth. Teeth have five surfaces, so make sure that all are cleaned. You may need to use special cleaning aids such as interdental brushes or floss to clean between the teeth and to remove the stain. Will it stain the rest of my mouth? It is possible that your tongue, gums and lips will pick up some staining from using disclosing products. 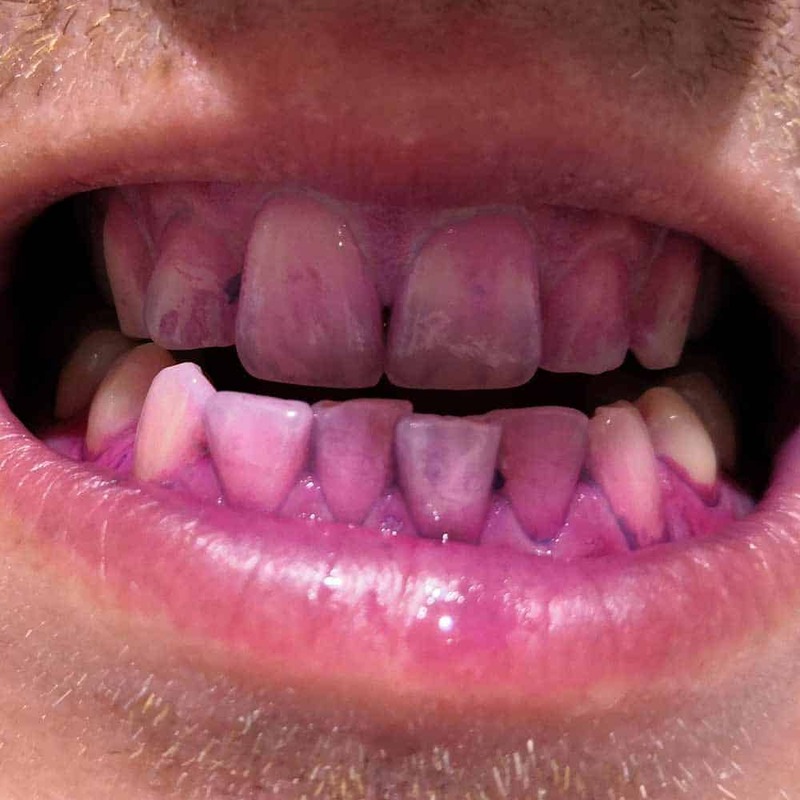 To reduce the chances of this, use vaseline or lip balm before staining your teeth. Afterwards, rinse out thoroughly after disclosing and try to avoid licking your lips. You can also gently brush your tongue. The staining is temporary and will wear off in a few hours. Will it stain my implant/crown/bridge? Can I use disclosing agents with my orthodontic appliance? Normally, yes. However if the brackets and bands are plastic they can pick up the staining. Best check with your orthodontist first. It is possible that disclosing products will stain clothing and furnishings. As best as possible avoid contact to stop staining. Do the tablets and disclosing agents go out of date? Yes. The packaging will usually give information of their shelf life or expiry date. Tablets tend to have the longest shelf life. Have you used disclosing tabs or similar before? What did you think of them, have them helped? If you have a question, that I have not answered be sure to let me know in the comments below. How long and how often should you brush your teeth?